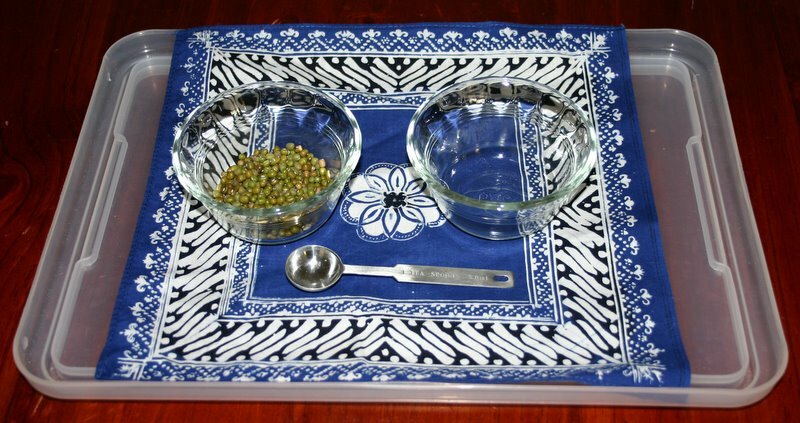 Scooping is one of the easiest Montessori style tray activities for toddlers and can be introduced at the same time as they are perfecting their spooning skills during meal times – giving them a little extra practise when spills are not so difficult to clean up! Have a look through your art and craft supplies, kitchen cupboards and junk drawers and you will be surprised at what you can put together in just a few minutes. These pompoms are scooped into a plastic chocolate container insert with depressions in it. The scoop comes from a washing powder container. This is a piece of packing foam that has indentations all over it; perfect for filling with marbles. The scoop is a pasta spoon from a child’s cooking set. Dry popcorn kernels in espresso coffee cups with a 1/2 teaspoon measuring spoon. 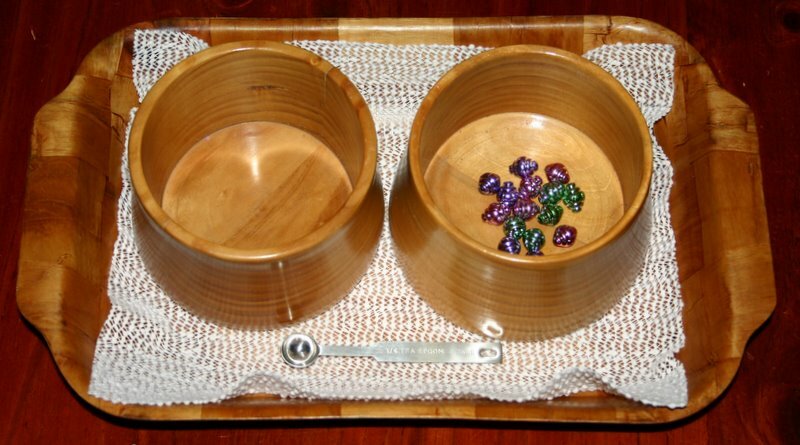 Montessori trays are traditionally presented with the material to be scooped on the left hand side to help with left to right directionality for later reading and writing skills. 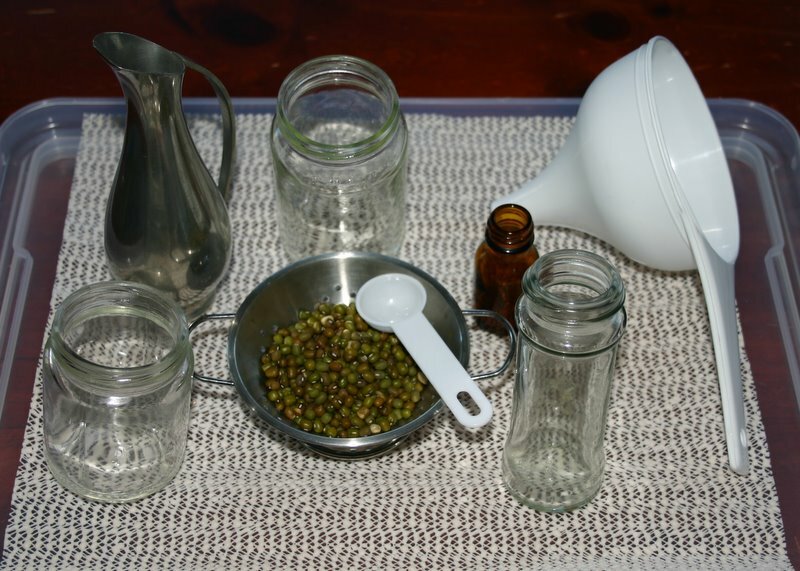 Green split peas are scooped from bowl to bowl. Coloured rice is a very attractive scooping material. 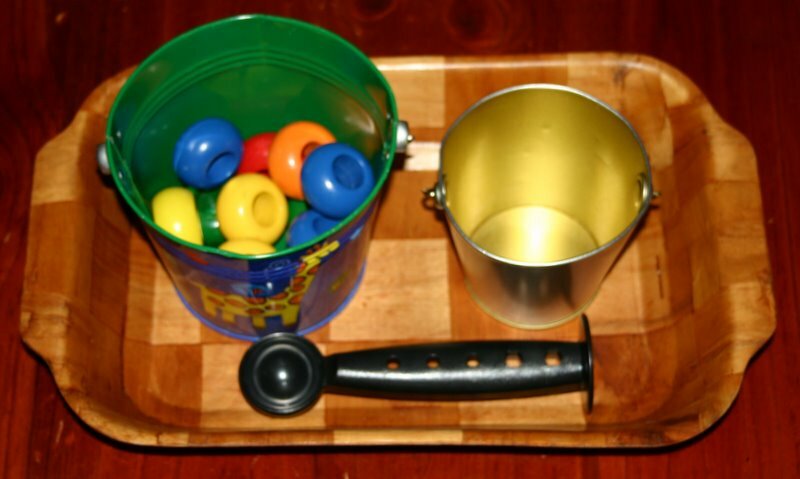 When my toddlers were older and no longer finding simple scooping activities very interesting, I gave them this tray with a variety of containers to scoop, pour and tip with. They loved it.